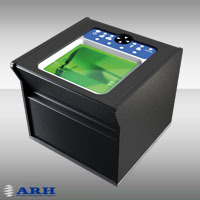 Fingerprint reader from ARH Inc.
AFS510 live scanner is a professional, compact 10 fingerprint scanning device for acquisition of single finger flats, rolls and four finger slaps. The FBI certified device provides superior image quality. The native segmentation and quality controll algorythm guarantees the best fingerprint result. The images can be saved in any industry standard format even in NIST structure. The forensic quality of the fingerprint scans makes them ideal for precise and reliable identification. Flexible integration is supported by the dual power system: The device can be powered through USB connection, or from external power supply. The durable, rugged housing resist any environmental effect. AFS510 can be efficiently used in various applications eliminating the need for paperbased fingerprint: police database, eVISA application, border control, etc.